During the summer when our children were small, they were forever asking for soda's or other sugar laden drinks. Also they wanted to emulate us by having a cup of tea. Those of you who have inadvertently tried giving your children drinks that may contain caffeine or large amounts of sugar know that these are hyperactive combinations. You also probably feel a little guilty thinking "my child should be drinking something that is more healthy and not something that wires them up." Well, we formulated a Kid's Tea. 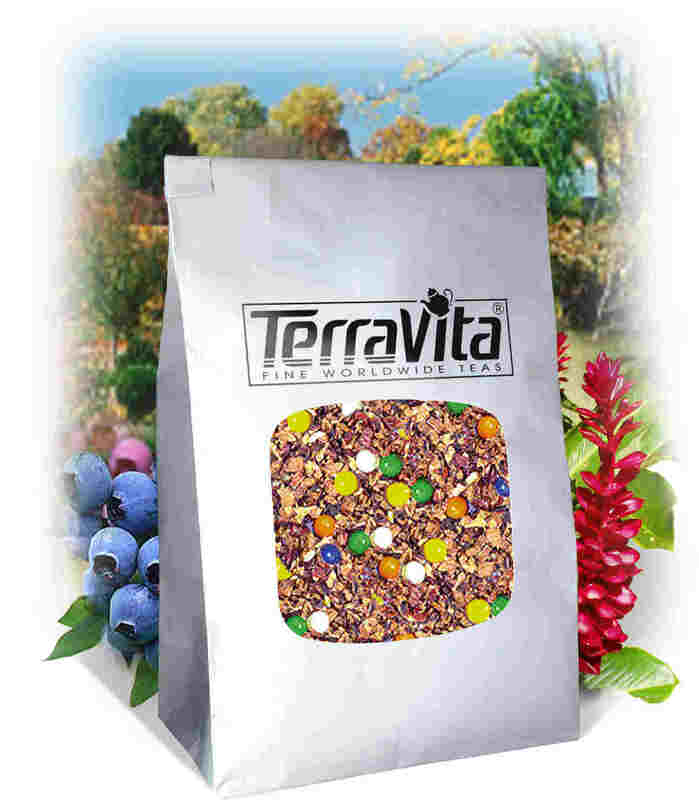 We theorized that the Herb and Fruit teas are full of natural fruits which are very tasty and refreshing; there are significant amounts of Vitamin C and other essential nutrients in these dried fruits; they are caffeine free .... so all we had to do was make a blend that was appealing to children's taste buds. This is where real children came in - they became human guinea pigs or perhaps a better term might be "young tea tasters." Interestingly, when formulating these blends the reaction whether they were tasty or not was swift, probably one of the fastest tasting sessions we have ever carried out. These teas can be enjoyed by children and adults alike, either hot or cold. At home we would always keep a pitcher of Kid's Tea in the refrigerator which our children consumed with great delight. let them pour their own drinks (outside of course! 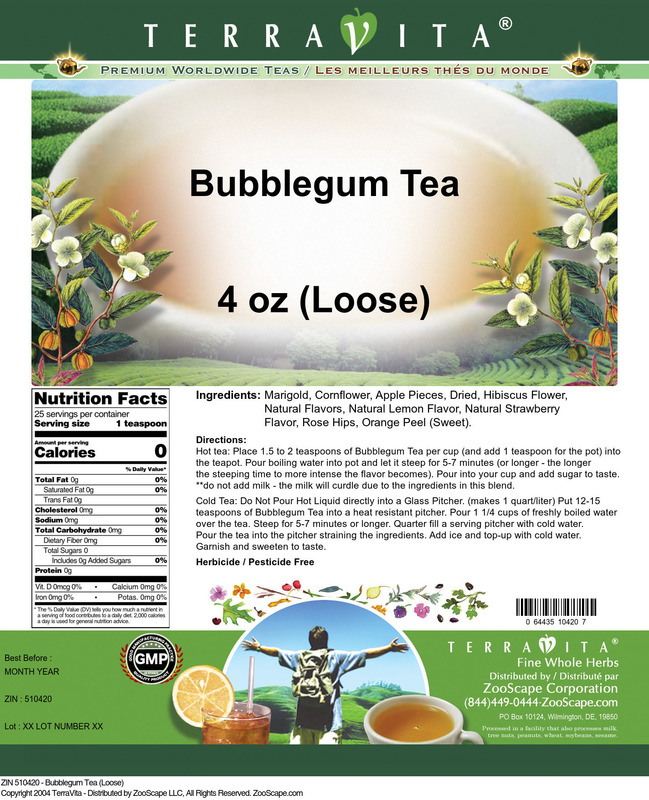 Hot tea brewing method: Place 1.5 to 2 teaspoons of Bubblegum Tea per cup (and add 1 teaspoon for the pot) into the teapot. Pour boiling water into pot and let it steep for 5-7 minutes (or longer - the longer the steeping time to more intense the flavor becomes). Pour into your cup and add sugar to taste. 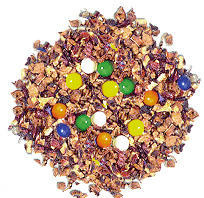 **do not add milk - the milk will curdle due to the ingredients in this blend. Cold tea brewing method: Do Not Pour Hot Liquid directly into a Glass Pitcher. (makes 1 quart/liter) Put 12-15 teaspoons of Bubblegum Tea into a heat resistant pitcher. Pour 1 1/4 cups of freshly boiled water over the tea. Steep for 5-7 minutes or longer. Quarter fill a serving pitcher with cold water. Pour the tea into the pitcher straining the ingredients. Add ice and top-up with cold water. Garnish and sweeten to taste.